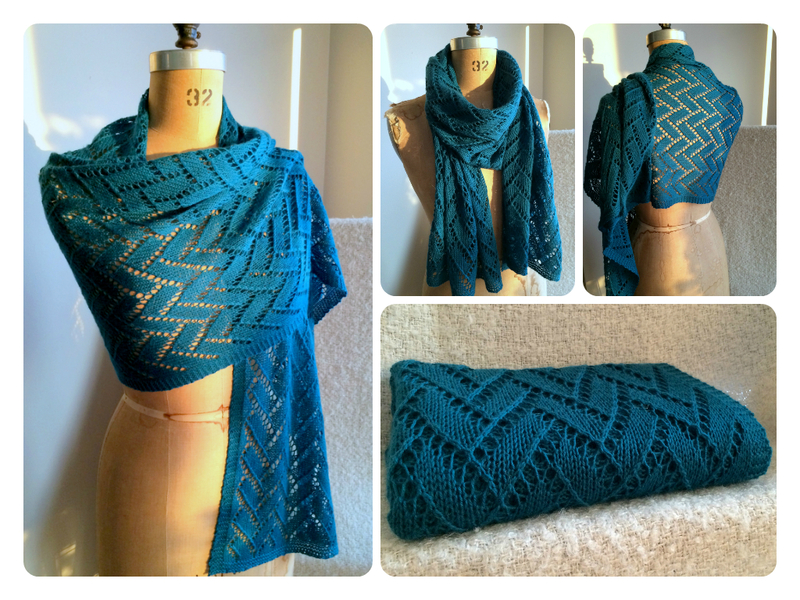 Just a short post to share with you guys my latest FO, a cutesy easy shawl started on September 27th, 2014 and finished on January 14th, 2015. It is my second FO of the year, W00T!! The pattern is called “Bamboo wedding shawl“, from Purl Soho, and the yarn I used is Cascade Heritage in the color Como Blue. I used a size 4mm needle instead of the 3.25mm needle the pattern called for because I have knitted with Cascade Heritage on 3.25mm needles before, and I just knew I wanted this shawl to be more airy and supple than that. As you can see it’s very thick, very wide, full of mistakes and not very long to boot. It was also my very first lace project, and I must say I made a lot of progress since then. The pattern that seemed so complicated to me at first now feels so easy and relaxing to knit now, and the result looks so much better too. Ah, the miracles of time! This entry was posted in Knitting and tagged blue, craft, fiber, geometrical, knit, knitted lace, knitting, lace, merino, passion, pattern, shawl, wool, yarn. Start it off with a bang! 2015 only just started, and with it comes a a few resolutions, projects and ideas to start off the new year afresh. This year, I made a few promises to myself. Nothing big or fancy, just a few things that I think are going to make things better. I want to learn how to relax more. I like to keep myself busy and I always have a lot of projects and ideas all lined up – not that it’s going to change, but I think I need to make more time amongst all those crazy projects to just take time for me. Enjoy some company, play with my cats, savor a good cup of coffee – that kind of thing. I want to start less, and finish more. I think it’s a crafter’s plague to have too many projects on the needles, and to really finish only a few of those. I broke my personal record for frogged projects in 2014, and it made me reflect on why those projects were frogged in the first place. Some of those were just failures that never saw the light of day, but I noticed that most of them simply happened to be projects I started but wasn’t inspired enough to work on them, let alone finish them! So this year, I want to work on fewer projects that I feel more inspired by, and take them to the finish line. I want to knit from stash. No, really. I want to weave more. I have a nice floor loom, and I love it, but I feel like I’m not using it enough. Part of the reason is that I do not own a lot of weaving thread, so my options are a little limited when starting a project. In 2015, I want to acquire a wider variety of weaving thread (How perfect, I can use the money I save from not buying yarn, eh?) and create more handwoven projects. I want to keep this blog going. I want to publish more designs. 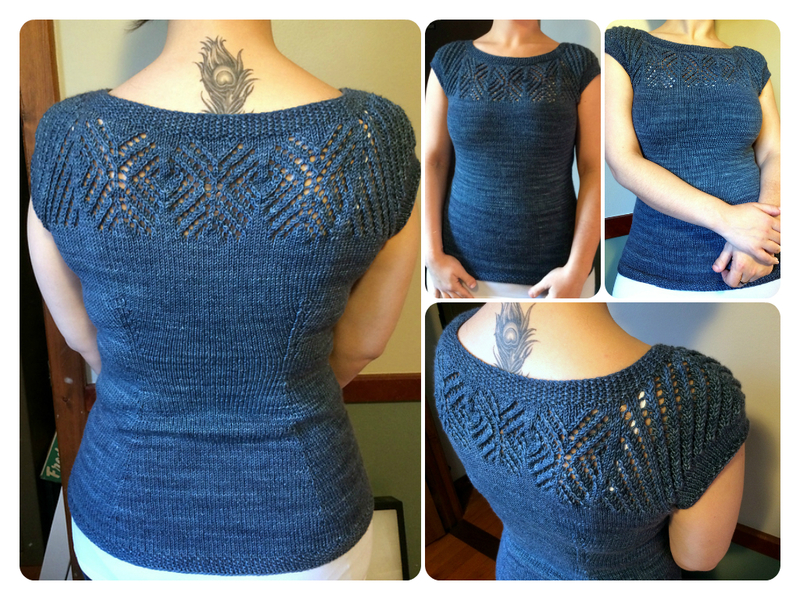 In 2014, I published my very first knitting pattern, my Sunny Summer Stripes sweater. Although it hasn’t really been a success so far, I want to keep trying. So in 2015, I want to create more, design more, and publish more. 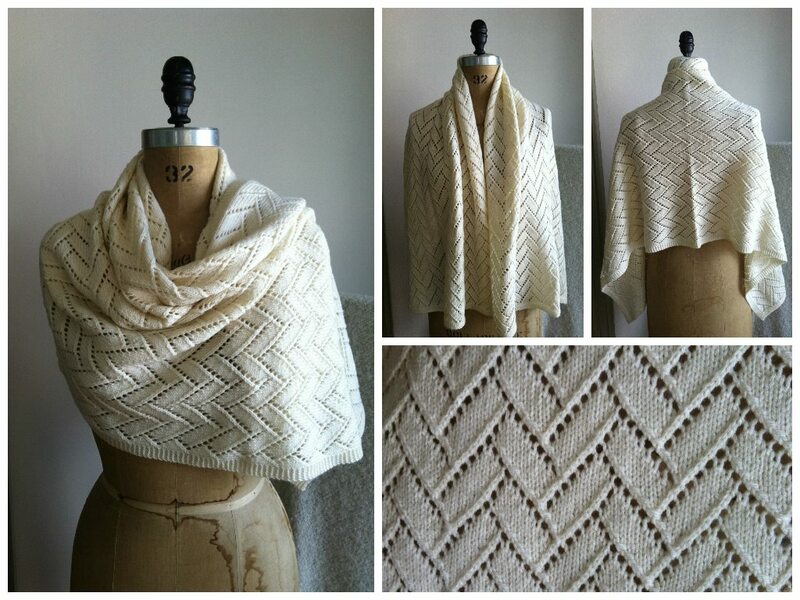 In the making, I currently have 2 sweater patterns and a sock pattern that should be published some time this spring. Once those are done, I’ll move onto something else, and I hope I’ll be able to write many, many more patterns this year. That is it for New Year resolutions! Enough, isn’t? This entry was posted in Knitting, Slice of life and tagged art, cashmere, craft, knit, knitting, new year, passion, resolution, snowflake, sweater, wool, yarn.